I don’t have any photos from the play we went to see on Sunday afternoon so I’m taking the opportunity to show you this dear little goat. It is five weeks old and a Nigerian Dwarf. It belongs to my nephew and with luck I’ll be bottle-feeding it in September when I help at the Perth Royal Show. The play we saw was called ‘Senior Moments’ and was like an old time music-hall show with a number of short skits being performed. Three of the six performers are very well-known for their TV and film appearances in Australian productions. They are aged 79, 77 and 72. I couldn’t help thinking how wonderful that they were still doing what they loved at such an age. The show has been very successful and has been playing round Australia since 2016. One woman, Benita Collins, was a mainstay of ‘Playschool’, a hugely popular local production. It seems any Australian actor or actress worth their salt has acted in Playschool. Part of Sunday’s performance involved a skit revolving around a TV show called ‘Old School’. The other main actors were John Wood and Max Gillies. John Wood starred in Blue Heelers among other things. @JohnRoberts may know these actors as I believe he has watched many of the Blue Heelers episodes. That sounds like a fun show - live shows are so much better, aren't they? This was a hoot and the cast seemed to be having as much fun as the audience. The goat is very cute! I have never heard of the actors but glad they are still doing what they love! None of them have done anything much outside of Australia. @JudyEv I have seen a few Australian shows in my life but would not remember any of the actors and actresses. @1hopefulman There are very few that I remember either but these three have been around a long time. Adorable little goat. It's great that these actors still give such pleasure at their age. I bet the skits were funny Judy. They were very clever. There were skits about Alzheimer's, being deaf, prostrate problems - nothing was taboo but nothing was offensive either. @JudyEv When these things are well done there shouldn't be any reason for offense. My husband skits me about being deaf lol. @Gillygirl That's true. I think everyone there related to all the problems that beset the actors. I'm glad you enjoyed the play. It's great to see people still active in their 70s. The picture is adorable. The play has been going since 2016. The original pianist passed away and has had to be replaced so that was pretty sad. @JudyEv That is sad. That's a good long history for the play. Good morning from here.Nice looking pets there. It's a dear little goat isn't it? what a wonderful play, plus it allows younger theater fans to connect with stars of the past! Yes, that's true. The actors seemed to be having a ball too. @JudyEv That is really cool! Thanks for sharing this! I love going to plays. It's been a long time since I have been. The last play I saw was The King and I. The King and I? I bet you enjoyed that. @JudyEv yes, it was great! That's been so long ago. This dwarf goad is lovely, I would love one as a pet. I am glad you enjoyed the show. Some actors are still incredibly good even if in their mid 70's. I'm sure the cast had as much fun as we did. @JudyEv This is the best, when everybody has fun. Yes, I am quite familiar with John Wood! Not only Sgt. Croydon in Blue Heelers but he was recently in the Doctor Blake Mysteries. In fact, I was aware of this show he has been touring in. It mentioned the Doctor Blake Mysteries in the program. He is very obese at the moment. Unhealthily so. @JudyEv Wood was a hefty fellow even on Blue Heelers and way overweight now. The goat is adorable. But it will be done with the bottle by then wont it? The play sounds like a lot of fun. Actually you'll probably right although he does keep them on the bottle for ages. We'll have more babies to feed by then I guess. @JudyEv I am sure you will. Maybe another thats very cute. I have the impression that Australians love to watch plays in big theaters. In Europe, no countries can beat the Austrian theater plays in Vienna. I felt I was transported to a different world with their props and sound systems. I can quite believe that the plays there are very special. We went to several concerts there but no plays. These are very old hands at the acting game and certainly seemed to be enjoying themselves. Glad you enjoyed the play. What a cute photo by the way. I am sure I would love this show! 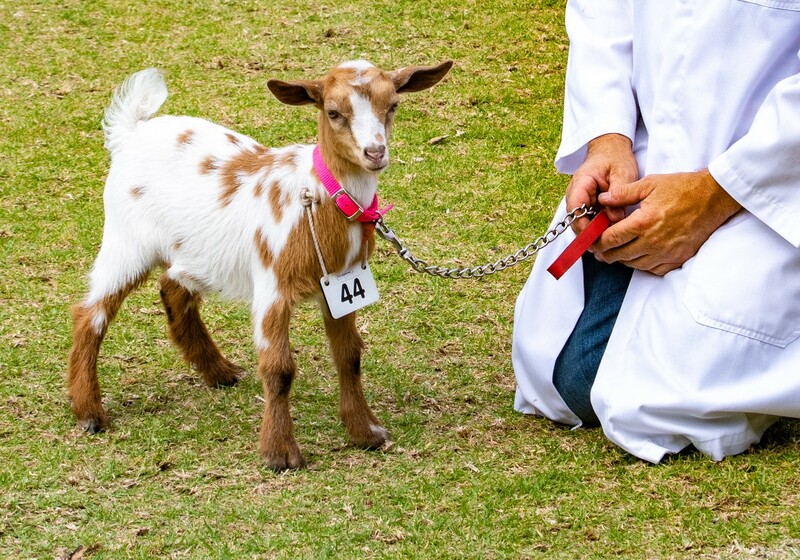 What a pretty little goat. It was a laugh a minute with some great lines. The play you saw sounds like lots of fun. Guess it was a comedy? That goat certainly is adorable. Yes, it was a comedy and we all laughed our way through it. That is an adorable little goat. It is so solid and sturdy for such a small thing - and very self-assured. Short skits do make one wait for the next one. I like such shows. There was a pianist right the way through and he also gave us two incredible solos. what a cute goat! you're having your goat fix again. pictures not matching the posts don't get my goat so no worries! which part of the play did you like most? Haha. You remembered about my need for a goat fix!! The cast did a dance about 'remember, remember' which was pretty fun. One of the verses was about remembering the name of his third wife and the children. The play sound like it was a good time. Live theatre is always so much fun. One of the cast was a bit like a loose cannon but I'm sure it was part of the act. What a pretty little goat that is. Glad that you enjoyed the play. She is such a healthy, solid, little thing but still so young.